Gricelda has a Specialty in Viticulture and Enology as well as a Masters in Agricultural Production. She was winemaker at Vinos Santa Úrsula for 15 years and currently has four years directing her personal wine project called Vinos Ugarte. 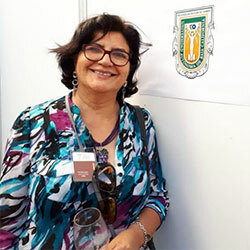 She is Professor and Coordinator of the Viticulture and Oenology Area of the School of Oenology of the Autonomous University of Baja California (UABC), at Ensenada, Baja California, Mexico. She has participated as a judge in several international wine competitions in the United States, Spain and Mexico.